Pharmaceutical and Biotech Start up projects need to consider the probabilities of each stage of the preclinical trial and clinical trial. We have a long experience in most disease area and manage updated and detailed data and statistics for each type of drug and treatment during the preclinical and clinical process. Our experience includes: Oncology, Neurology, Hematology, Infectious Diseases, Metabolic, Allergy, Endocrine, Urology, Autoimmune, Neurology, Cardiovascular, Psychiatry, Ophthalmology, Gastroenterology, Respiratory, etc. We also have a special focus on Monoclonal Antibodies, Immunotherapy, and Stem-Cells. Analyse and help to optimize risk mitigation during the clinical trial process. 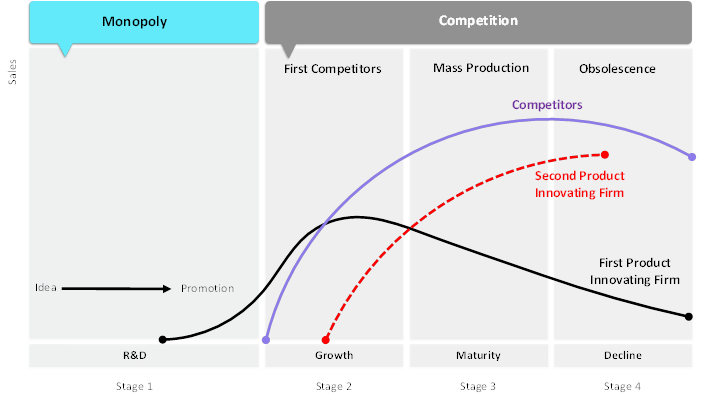 After 2-3 years a new technology more efficient (violet curve) appears and threat to diminish both margins and sales. When a client send us a business plan, we analyse the likely ranges for KPIs at a product, product group and portfolio level, and the likelihood that any base forecast or internal plan can be achieved e.g. •How optimistic/pessimistic are these plans? •What are the main reasons driving possible bias? •What is the best way to allocate resources (and contingencies) to benefit from diversification and reduce resource-hoarding?